A central theme of the book is the decline in the Australian public’s understanding of forestry science, which evolved in 18th Century Germany and spread around the world via its uptake in Britain. How environmental activism sprung up and evolved. The role of the media in fostering a certain view of native forestry. How politics and bureaucracy helped implement a ‘green’ agenda. Detailed discussion about ‘saving’ the Leadbeater’s Possum and how this affects the timber industry in Victoria’s Central Highlands. The process surrounding the reservation of Victoria’s river red gum forests. The ‘peace deal’ that reserved large chunks of Tasmania’s forests. Active management or benign neglect –the burning question for forest management and biodiversity. Mr Poynter said the nationwide loss of community respect for forestry, foresters, forest industries and their workers was disturbing. “Forestry has had its share of errors, trials and tribulations as it negotiated a way between society’s pragmatic socio-economic demands and the needs of the forests themselves,” he said. Critics’ concerns had been amplified by ‘save-the-forest’ environmental campaigning and mostly one-sided media reporting. “Ultimately this has equated the broad science-based discipline of forestry with only one activity – wood production,” he said. Mr Poynter said foresters, who were scientists academically-trained in all aspects of forestry, were now “loggers” driven by greed and entangled in corruption, wood production a “red-neck” pursuit. There was little appreciation of socially useful wood products and the workers who produce them, despite the general appreciation of the durability and beauty of native hardwood floors and furniture. “Mostly missing from the public discourse has been the scientific justification for forest management and use. Forestry science as practised by foresters is integral to the hows and whys of forest management,” he said. Mr Poynter said there was a general belief that forests were being logged without any foresight and regulation simply because a few rural workers needed a job. However only 5%-8% of Australia’s native forest was used for timber production in a cycle of harvest and regrowth, he said. This fact raised serious questions about environmental ideology and how it had evolved into politically correct ‘conservation culture’. Mr Poynter, who is a forest practitioner, said his book aimed to examine this ‘conservation culture’ and how it was used to bring about political outcomes. 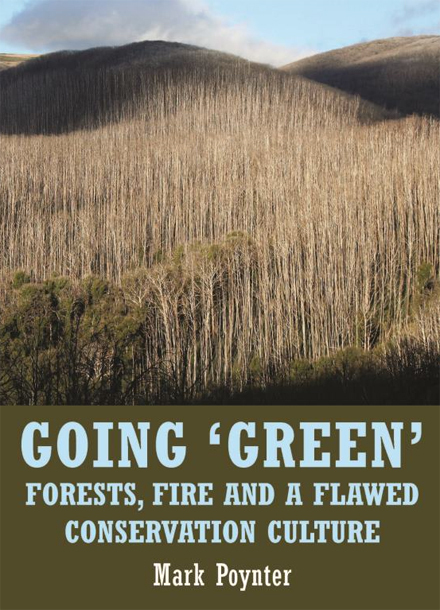 “Going ‘Green’: Forests, Fire and a Flawed Conservation Culture” is published by Connor Court.